The Sapphire Guest Bed has a full size single mattress as the main bed and a handy 2ft 6" trundle under the bed. 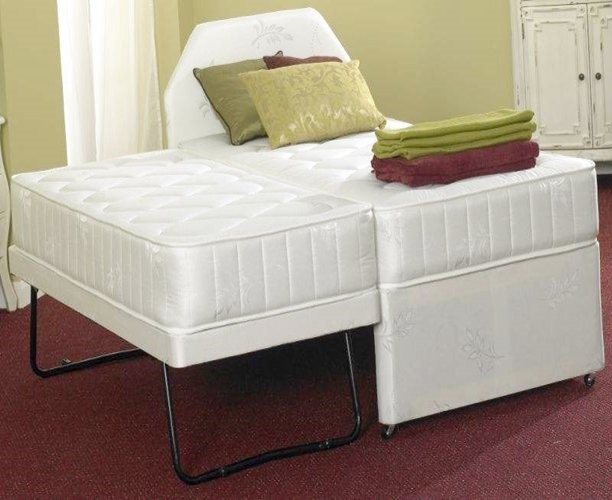 The trundle easily rolls out and raises to match the main bed height if required. This is a high quality and comfortable guest bed with a superior, firm spring system, perfect if going to be used everyday. Your guests will experience a very comfortable sleep, from the deep fillings and luxurious deep quilted damask mattress. The Sapphire is a great Sprung Mattress at a great price. The Sapphire gives you firm support from the firm spring system. The Sapphire has a diamond quilted finish for smooth cushioned comfort. This 12 ½ Gauge Open Coil Spring Unit consists of a 6 gauge rod wire frame support, allowing this to be a firm mattress. Finished in a Luxurious Damask Cover. The trundle bed and mattress measurements are: W 2ft 6" X L 5ft 9".